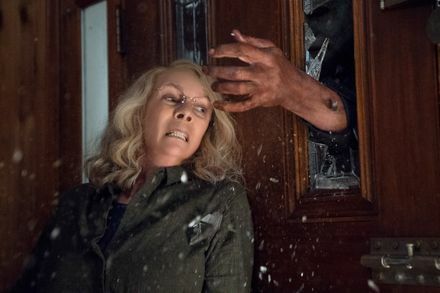 Deciding to recon almost an entire franchise is a risky move, but that’s exactly what Blumhouse Productions did when it greenlit a brand new installment of a 40 year old series: Halloween. The stars seemed to align for Blumhouse: an able director was on board (Stronger‘s David Gordon Green) and helping Green with the script was actor Danny McBride. I guess having Jamie Lee Curtis interested in reviving the role of Laurie Strode didn’t hurt either. Or that John Carpenter was interesting in revamping his legendary score. Honestly, how did this even happen!? Halloween opened this weekend to tons of fan fare from those both skeptical and psyched. The 2018 installment that returns Michael Myers to the screen eliminates every single sequel and remake from the timeline, picking up 40 years after the events of the original 1978 Carpenter classic. Rebooting this alternative timeline isn’t as sacrilegious as it sounds; the Halloween sequels have always been fraught with narrative issues, weird looking masks, and one highly gratuitous cult that shall not be named. This was both a fresh start and a labor of love made with absolute admiration for Carpenter’s work. The movie opens as two podcast journalists (Jefferson Hall and Rhian Rees) head to Smith’s Grove Sanitarium to interview Michael Myers in captivity. They’re surrounded by mentally ill patients as they step closer and closer to the monster who murdered five teenage girls that Halloween night so long ago. The team taunts Michael with his old white mask hoping to get him to speak his first words in decades, but it’s to no avail. It’s a tense scene that shows glimpses of a mask-less Michael a day before a bus transfer transporting him crashes releasing the evil back to the wild once again. That’s when the bodies start dropping. And then there’s Laurie. She’s 40 years older and traumatized by PTSD. She’s part survivor, part doomsday prepper. Her kitchen island is rigged to cover a hidden panic room filled with her gun collection, jarred foods, water and anything else you might need if you’re hiding out from a masked killer. She has a tricky relationship with her adult daughter Karen (Judy Greer) who was removed from her custody when the girl was only 12. She also has a loving, yet distant relationship with her granddaughter Allyson (Andi Matichak) thanks to her continuously debilitating agoraphobia. Michael’s back on the street and it’s exactly how Carpenter’s original monster operated: pure evil with no purpose and no motivation. The beauty of this story is the examination of how Laurie survived these last four decades and the effects of what that night in 1978 did to her psyche. She suffered a lot of loss, not only her murdered friends, but her daughter as well. The complicated dynamic between the three intergenerational women is a meaty chunk of what makes this Halloween entry so successful. Laurie, who is often viewed as crazy and unstable by Karen, is now the only person who can keep them alive once Michael’s on the prowl. This character work heightens the suspense in the film’s latter half and climax. As mentioned, Green’s movie has the utmost respect for the technical and narrative aspects that made Carpenter’s original so influential. He plays with lighting and fog to build tension. He gives Michael that “stranger off the street” feel that made him so terrifying to begin with. He mixes classic off-screen kills with brutality to scrape under the skin of the most desensitized horror fans. Green also utilizes Carpenter’s score in all the right places. Carpenter’s involvement alone should be enough to appease Halloween purists. Along with his son, Cody Carpenter, and godson, Daniel Davies, Carpenter updates his original theme adding heaps of electronic and industrial layers to add sharp modern edges to his original work. Carpenter will forever inform this series should it continue, and here, his involvement helps Green establish a new tone and timeline while giving it some concrete bones. And then there’s Jamie Lee Curtis. Could this have worked without her? Doubtful. Though we’ve been down this road before with Halloween H20, the 2018 version feels more realistic. It focuses on the psychological damage that would occur if one was to survive such horror. Curtis is Laurie Strode. She’s incredibly in tune with the character’s fears and emotions, tapping into Laurie’s most primal survival instincts. It’s a performance perfectly in line with the women’s movements of today. Say goodbye to the Final Girl and slasher-victim tropes of the past; Curtis leans heavily into Laurie’s (and her own) feminine force. Thanks to Laurie and her family, this is very much a story about the power of women as it is about Laurie’s fight to survive Michael and her inner trauma. This almost makes me want to see it. Almost. There was only a LITTLE bit of exposed brains, Bali.